Villa Toscamar is a pleasant 4 bedroom property ideally located just a 5 minute drive from the sandy Arenal Beach, with its selection of restaurants, shops and bars. The private pool is perfect for cooling off on a hot summer's day, and the BBQ area and outdoor seating ensure you have everything you need for alfresco dinners. Javea Old Town, with its charming cobbled streets and restaurants, is also only 10 minutes away. Pool heating, WiFi and air conditioning/heating in all the bedrooms and lounge are included. The inviting outdoor pool and fabulous location, just a quick 5 minute drive from the sandy Arenal Beach. There is a private pool surrounded by plenty of sunbeds, perfect for lazy summer days enjoying the sun. 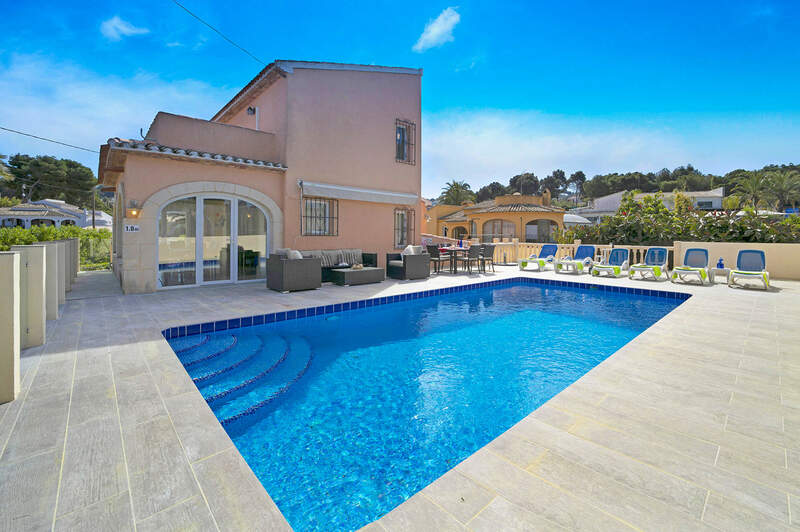 To the far side of the pool, steps go down to the BBQ terrace, complete with a brick BBQ and table and chairs to enjoy alfresco dining in true Spanish style. Double gates lead to off-road parking for 2 cars, with a path ahead leading round to the BBQ terrace or up steps on your right to the front door. An arch separates the open plan lounge and dining room, which have lovely beamed ceilings and a light, airy feel. There are 2 sofas, a coffee table and flat screen TV, as well as a dining table and chairs for 8 people. The dining room has patio doors leading to the pool area and large arch windows which flood the room with natural light. The modern kitchen overlooks the BBQ terrace and is fully equipped with everything you need to cook your delicious holiday meals. On the ground floor there is a double bedroom with en suite shower room and 2 twin bedrooms which have use of a shared bathroom. Upstairs, there is a large double room which has an en suite shower room and access to a private terrace. All the rooms are comfortably furnished with a contemporary feel. This villa is registered and licenced by the Generalitat Valenciana to comply with local legislation on holiday rentals. This number is: VT-442769-A. Villa Toscamar is set in a pleasant, enclosed plot, just a 5 minute drive from Arenal Beach and its array of shops, restaurants and bars. Javea Old Town and Port are also 10 minutes' drive away, where you find even more eateries and shops. A few restaurants and a minimarket are handily located within 5-10 minutes' walk from the villa. You'll find the nearest supermarket just a few minutes' drive from the villa. Javea has a lively market every Thursday, selling local produce, shoes, handbags, belts, clothes and jewellery. There's also an indoor market, open most mornings, next to the church which has a wide selection of local products, mainly food and drink based. Why not stock up for a BBQ back at the villa? There are also several shops along the Arenal Promenade too. You will find a couple of restaurants within walking distance of the villa. Alternatively, the bars and restaurants on the Arenal Promenade serve both international and local Spanish cuisine, so there is something for all taste buds. The historic old town of Javea, with its charming cobbled streets, has plenty of bars and restaurants. For fresh fish of the day, take a trip to Javea's port and watch the boats come in. There is a stall offering the day's catch fresh off the boats. Javea has so many different beaches, mainly pebbles or rocky coves - great fun for snorkelling. The sandy Arenal Beach is 5 minutes' drive away and is one of Europe's Blue Flag beaches. It is set in a bay with a promenade behind it where you will find local crafts for sale in the evenings (summer only), many restaurants, bars, shops and a supermarket. Alternatively, try the pebbly cove of Granadella, which has been awarded best beach of Spain several years running and is a 10 minute drive from Villa Toscamar. There is plenty for all the family to enjoy in Javea including go-karting, horse riding, mini golf, tennis and paddle (a cross between tennis and squash). Those who love the water will be spoilt for choice with scuba diving centres, windsailing and jet ski tours available. Take a trip into the old town of Javea and explore the cobbled streets and white washed houses. Visit the museum, which has a roof terrace with wonderful views. Denia Castle is worth a visit to look around the ruins, then take a wander down Marquesa de Campo Street for some tapas and shopping. Or if you fancy a full day out, Benidorm is only 45 minutes' drive away offering a plethora of different things to do and see. Javea Golf Club is just a 10 minute drive from Villa Toscamar, and the award-winning Marriott Golf and Spa Resort is a 20 minute drive away. The beautiful orange and grey Mount Montgo rises above Javea, resembling the head of an elephant. There are many signposted walks on the slopes of this National Park and you can even climb the mountain if you wish, avoiding the heat of the day. Villa Toscamar is not available to book for season as it is sold out. Take a look here at the Costa Blanca villas that are currently on sale.